A bipartisan group of mayors across the U.S. are calling on President Trump not to end the 2012 the Deferred Action for Childhood Arrivals program, or DACA, created by President Obama in 2012. The group represents the U.S. Conference of Mayors and come from cities such as Meza, Arizona, Los Angeles and Providence, Rhode Island. Their statement came at the same time as a DACA National Day of Action, which involved at least 66 mayors across 29 states and Washington, D.C.
"DACA has given hundreds of thousands of hard-working, ambitious young people new hope of building lives in America -- and spared scores of families the heartbreak of separation. 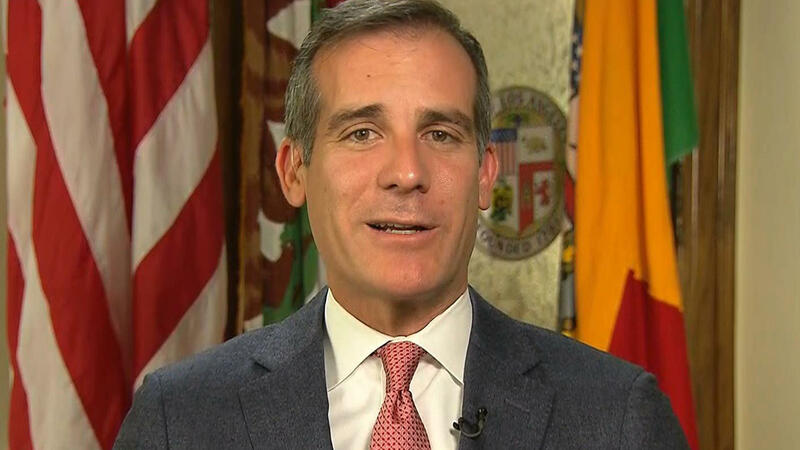 We will do everything we can to help at the local level, but the President and Congress should act now to give them the security and peace of mind that everyone deserves," said L.A. Mayor Eric Garcetti. DACA has deferred deportations for people who entered the U.S. as children, or who were under the age of 31 before June 15, 2012. Applicants must have also continuously lived in the U.S. since June 15, 2007 and come to the U.S. before his or her 16th birthday. Since Mr. Trump's inauguration, undocumented students have feared that the president will reverse the DACA program. "Our residents who have received support from DACA are hardworking Americans who have graduated high school, gone to college and have made a positive impact on this country," said Mesa Mayor John Giles. The Trump administration is currently mulling ending the DACA program. Aboard Air Force One on Wednesday, White House press secretary Sarah Huckabee Sanders said that the review of the program is not yet over. "They've taken a lot of accounts, certainly, into this process. This has been a very lengthy review and it's certainly not over. It's something that is still being discussed and a final decision hasn't been made," she said. The Department of Homeland Security formally rolled back Obama's 2014 immigration actions that created Deferred Action for Parents of Americans and Lawful Permanent Residents, or DAPA, program that would have deferred deportations for the undocumented parents of U.S. citizens or legal permanent residents who have been in the U.S. since before 2010.